Vanilla Launcher eats memory. The linked images are with the launcher sitting at the login screen. 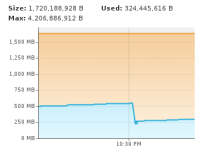 It slowly eats memory until it hits over a gig when a GC occurs and it falls back down and repeats repeatedly. The max memory that it eventually settled at having allocated on my system was ~1.7gigs and after a GC event it was only using ~290megs of the allocated 1.7gigs that it was not releasing to the system. The largest sizable growth appeared the be the int primitive arrays, however the char primitive arrays were fairly large as well while also growing at a fairly decent rate. Everything else seemed to be fairly ignorable in both growth rate and memory usage eating a combined total of less then 150megs. This is while using Oracles recently released Java8. Have not tested on Java7.